2017 was a big year for us at ASA. We’ve been busy, releasing new editions of all three Pilot’s Manual textbooks (Flight School, Ground School, and Instrument Flying), William Kershner’s The Student Pilot’s Flight Manual, Bob Gardner’s The Complete Private Pilot, our Oral Exam Guide titles (Private, Instrument, Commercial, Multi-Engine, CFI, and Aircraft Dispatcher), Dale Crane’s Dictionary of Aeronautical Terms and Aviation Mechanic Handbook, multiple FAA Handbooks, and of course our Test Prep and FAR series titles. Today, I’d like to recommend three brand-new products from ASA, sure to suit the aviator on your holiday shopping list. This is the perfect gift for a remote pilot, whether they’re just a hobbyist or looking into monetizing their drone flying. Written by a team of UAS-industry experts, this book covers the history of drones, design philosophies, technology, and safety practices, as well as resources to help you make well-informed decisions regarding purchase and use and determine a path forward through the complex legal, business, operational, and support considerations. For the CFI in your life, Arylnn McMahon shares forty-four stories that demonstrate the fundamentals of instructon (FOI) principles in flight and offer practical strategies for dealing with both common and unexpected situations—all with wisdom, grace, and humor. Through artful storytelling, McMahon shows how a successful instructor is sometimes a psychologist, other times a detective, and always a gatekeeper enforcing rules and cultivating the behaviors required to be a responsible aviation citizen. by Aviation Supplies & Academics, Inc.
Years in the making, the new CX-3 Flight Computer is the ultimate gift to the pilot on your list. Check out our rundown of all of it’s features in last month’s blog post. The CX-3 Flight Computer makes flight planning simple by taking confusion out of the equation. Fast, versatile and easy to use, the CX-3 delivers accurate results quickly and efficiently. It can even be used on all FAA and Canadian pilot, mechanic, and dispatcher knowledge exams. Whether used for flight planning, ground school, or knowlledge testing, the menu organization reflects the order in which a flight is normally planned and executed, resulting in a natural flow from one function to the next with a minimum of keystrokes. For more holiday gift ideas, check out our 2017 Holiday Gift Guide. And stay tuned, we’re working hard to deliver a lot of new books in 2018 which we will be able to tell you about soon! The aviation industry has a language all its own, and the Dictionary of Aeronautical Terms (or “the DAT” as we call it here) is an essential reference to make sense of it all. ASA editorial and support staff even rely on it as a guide to industry-standard terminology and jargon. Now with over 11,000 terms, the DAT includes definitions from 14 CFR Part 1 and other parts, the Pilot/Controller Glassary from the AIM, glossaries from government handbooks and manuals, and more. We’ve also included useful tables (phonetic alphabet/Morse code, triginometric functions, and Periodic Table), an exhaustive list of acronyms, abbreviations, and V-speeds, and over 500 illustrations. The DAT is useful for anyone in the aviation industry, but it’s the perfect reference book for a student pilot who’s absorbing a lot of new and critical information. It is a reference that will serve a student pilot over the course of their training and aviation career. In the new edition of The Savvy Flight Instructor, Greg Brown shows not only how to make flight training engaging, effective, and rewarding for students, but also how to make flight instruction work as a business. Greg covers marketing, using social media and other internet tools to reach prospective and inactive pilots, and how to network and build relationships with local, regional, and national flying organizations without losing sight of the fact that flying is fun. Also included are guest perspectives from commercial pilot Heather Baldwin, CFI and DPE Jason Blair, flight training standardization expert Ben Eichelberg, flight school owner Dorothy Schick, and flight-training writer Ian Twombly. In this brand-new fourth edition of Severe Weather Flying, author Dennis Newton continues to build on great resource that’s been in print for over 30 years. Weather continues to challenge aviation, but the scientific understanding, tools, and models have evolved making it easier to predict and survive severe weather. As a meteorologist, flight instructor, weather research and engineering test pilot, Dennis Newton believes that by understanding weather science, pilots can truly lessen their chances of encountering thunderstorms and other severe conditions. This is an excellent book for an aviator of any skill level, as it offers strategies for better airmanship and greater understanding of atmospheric sciences and insight into the weather research that shapes aviation policy. Looking for a specific recommendation? 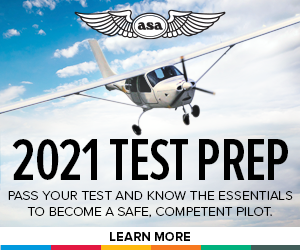 Give ASA a call at 800-272-2359 or email us at asa@asa2fly.com or cfi@asa2fly.com. Check out past Editor’s Picks posts for more recommendations, including last year’s stocking stuffers! Looking to up your skills or just relax with a book at your campsite at EAA AirVenture? Today we’ll share a few summer reading suggestions for the aviator. And speaking of AirVenture, be sure to come visit us this week in Hangar B, Aisle D! A fantastic collection of articles written by famed aviator Bill Kershner during his more than fifty years of flying. In these stories, Kershner details some of the more humorous, humiliating and helpful things he has seen and readers are sure to find them amusing and entertaining. Those who are pilots themselves may find some incidents all too familiar. Mostly chronological, these stories begin with Kershner’s first flying experiences, through his career as a Navy fight pilot and then on to the later years as a corporate pilot and instructor. DPE and CFI Chris Burger examines the nitty gritty of both airplane and helicopter operation. Cockpit Procedures is written as a guide to proper airmanship with an emphasis on developing good habits as a PIC. This includes workflow management, using checklists, priorities and thinking during abnormal and emergency procedures, understanding and using POHs, practical tips for normal flight, and maintaining a healthy balance of caution and confidence. 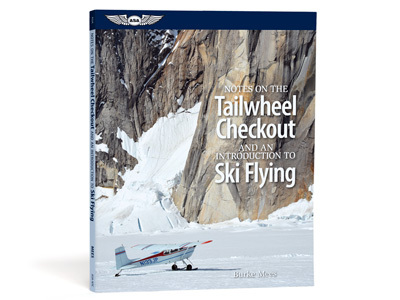 Though written for brand-new pilots, we recommend this book to aviators of all skill levels. From 1946 to 1986, Frontier Airlines flew the Rocky Mountain region, where their pilots achieved the best safety record in civil aviation. In the early days, crews hand-flew DC-3s through “tornado alley” without radar, and in and out of small airports hidden deep in mountain canyons, with approaches often referred to as “black holes” due to their almost ominous darkness and lack of reliable visual references. Tex Searle shares his and other Frontier Airlines captains’ stories in this collection of tales from a remarkable period in aviation history. Today I’d like to highlight three books from author, pilot educator, and photographer Greg Brown. Greg has been flying since 1972 and writes the Flying Carpet column in AOPA Flight Training magazine and maintains the popular Facebook group Greg Brown’s Student Pilot Pep Talk. You can find more of Greg’s work including his aerial photography on his blog. Written as an introduction to general aviation, You Can Fly! features gorgeous full-color photography to lure prospective pilots into learning to fly. You Can Fly! provides a roadmap to obtaining your pilot’s license while dispelling myths and rumors at the same time to show that the joy of flying really is for everyone. This book makes an excellent gift for prospective pilots or young people interested in learning to fly. Greg Brown’s spirited autobiography recalls his path to becoming an authentic aviator. Told though memorable private accounts of flying adventures to impart lessons he learned along the way. Through these flying stories Greg defines what it means to be a pilot, reflecting on an epigraph from Sir Walter Raleigh, “The engine is the heart of an aeroplane, but the pilot is its soul.” I’d recommend this book to aviators of any age and ability. Intended for aspiring and seasoned flight instructors alike, including flight school managers, The Savvy Flight Instructor contains a wealth information, advice, and tools that can be put to use right away. Savvy covers all aspects of the business of flight instruction, from marketing to achieving continued customer success to building a culture of professionalism. This brand-new edition addresses the needs and complications of flying, teaching flying, and running a business in today’s market. This book is an indispensable resource for all CFIs and newly-minted private pilots considering their next step. Thanks for reading the Learn to Fly Blog. If you’d like to receive new posts the moment they’re published in your inbox, subscribe with your email at the top of the sidebar to the right. This information will not be shared with anyone. 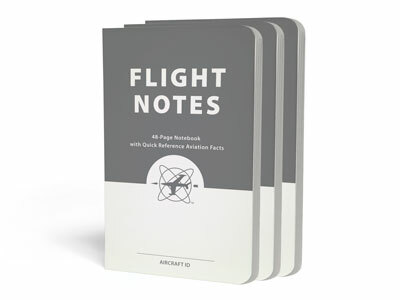 This set of 3, 48-page notebooks is the perfect pocket reference for any pilot. Each notebook contains quick reference aviation facts including lists, tables, and graphs that are handy during preflight planning or while enroute. The remaining graph paper style pages can be filled with any flight notes an aviator might want to include about the aircraft or any of its journeys. Mark it up with an altitude-proof pen! 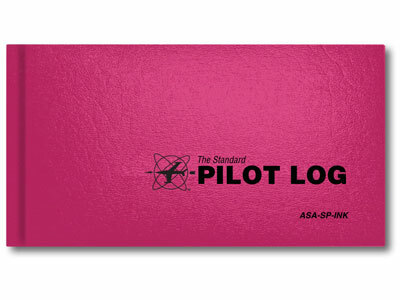 The industry standard for over 55 years now in pink! When choosing a logbook, it’s important to make sure it will meet the needs of the pilot and the type of training and flying they plan to do. This bold and brightly colored logbook has the same trusted page and column layout as our popular black logbook it just looks different on the outside. While proper fueling of an aircraft is important to any flight operation, so is proper fueling of the pilot-in-command. Long before the preflight begins, a pilot must prepare both mentally and physically to ensure fitness for flight. ASA recommends starting the process by filling the Auxiliary Tank with coffee, tea, or your favorite hot or cold beverage to help start the day and prepare for a safe journey. Microwave and dishwasher safe cup and lid. Our offices will be closed December 24, 25, 31, and January 1. Happy Holidays from all of us at ASA! 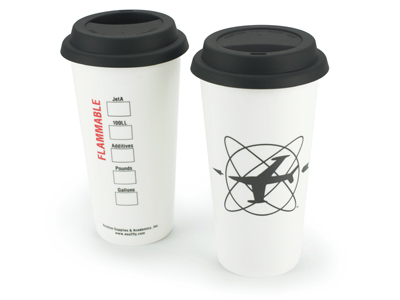 Today I’d like to recommend three great holiday gifts for pilot’s. Along with covering everything an aviation professional or aspiring aviator needs for their advancement, ASA has a large aviator’s library of books by pilots for pilots ranging from history, to best practices, to personal accounts. Making Perfect Takeoffs and Landings in Light Airplanes shows pilots how to develop total awareness for the situation, the airplane, and the self; and to convert that awareness into perfect takeoffs and landings. Each chapter describes a specific takeoff or landing situation and presents methods, and the logic behind each method, to master techniques key to each situation. 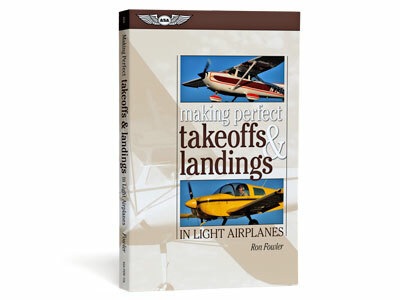 This book makes a great gift to any student pilot working to hone their technique and build confidence in their own takeoffs and landings. 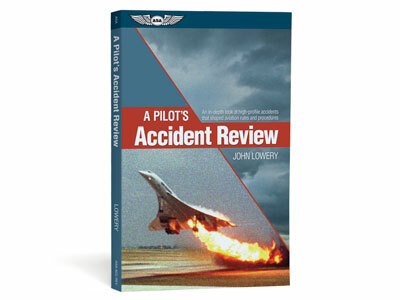 A Pilot’s Accident Review is an in-depth look at the high-profile accidents that shaped aviation regulations. This book is both an intriguing history of some very memorable events and an investigation into why accidents occur in the first place. Lowery uses NTSB reports, photographs, and interviews with survivors to illustrate the lessons we can learn from aviation accidents. Along with offering best-practices and his own advice along the way, this book is ultimately a cautionary tale for pilots of all abilities to train seriously, regularly, and to identify and correct the aspects of their own personality and flying habits that could precipitate accidents. This book combines the author’s years of experience in flying and teaching tailwheel skills with the sense of adventure flying can offer. Mees covers the basics in tailwheel/ski flying as well as advanced topics such as multi-engine tailwheel airplanes and mountainside ski-plane takeoffs. Gorgeous photography and clever illustrations throughout make this book a perfect gift to any pilot thinking of where their flying skills will take them.